If your exercise routine needs a bit of Winterfell flair, then a new line of Adidas sneakers might be just your speed. 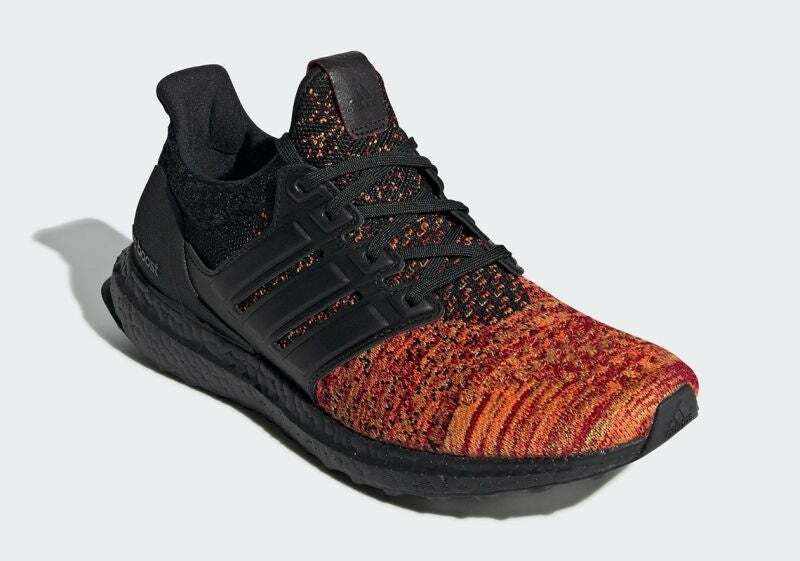 Adidas recently debuted the first official look at their Game of Thrones collaboration, which features several different new takes on the Ultra Boost style. The first official shoe (via Kotaku) shows an orange and black design that seems to be a nod to House Targaryen. Photos of additional Game of Thrones designs have been released by solebyjc, with an all-white design for Daenerys Targaryen, and a blue-and-white design that appears to be inspired by the White Walkers. The Winter Is Here! ❄️ adidas UB 4.0 x Game Of Thrones “House of Targaryen” Releasing in 2019?⚔️? First Look at the adidas Ultra Boost x GOT “WHITE WALKERS” ❄️? THE WINTER IS HERE ? This line of shoes was first initially teased earlier this year, with possible mockups hinting at designs inspired by the Night's Watch, House Lannister, and House Stark. It's unclear if and when those shoes will officially be announced. This marks just the latest nerdy collaboration that Adidas has done thus far this year, with a Dragon Ball Z-themed line also being released. But it's pretty easy to see why a Game of Thrones line would become a reality, seeing as the beloved HBO adaptation of the series is about to reach its conclusion. "Who knows if it will be satisfying for the fans. I think a lot of fans will be disappointed and a lot of fans will be over the moon, I think," Sophie Turner, who plays Sansa Stark, said in a recent interview. "I think it will be really interesting to see people’s reactions, but for me reading the script it was just like heartbreaking to read at the very final page of the script it just says, ‘End of Game of Thrones’. That was really emotional." The Targaryen-themed sneakers are expected to roll out in January, with the other debuting over the course of the year. Hopefully, fans will be able to score them just in time to run away from their final season feels. Will you be adding these Game of Thrones sneakers to your collection? Let us know what you think in the comments below. Game of Thrones' final season is expected to debut in 2019.